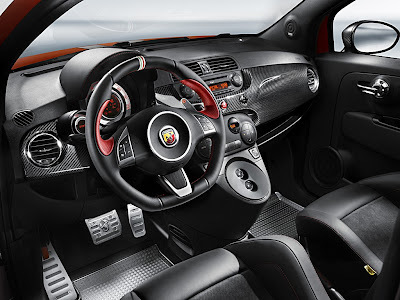 The ultimate road going Fiat 500 is the Abarth 695 Tributo Ferrari. Here is a quick video to get you daydreaming. OK, so we know the Abarth is coming to the U.S. Just when, no one at Fiat seems to be saying. However, this piece of information should be interesting and available somewhere. How much does the 500 Abarth sell for [new] in Europe vs. the "normal" 500? Then, what is the asking price [new] for the Tributo? Knowing these numbers might give some of us aspiring US Abarth 500 owners some idea of just how many cans and bottles we'd have to turn in to collect enough money for a down payment. And will it come in the cabrio form? As for the when I haven't a clue... but as for the price, my own personal experience has been that if the MSRP price for the loaded 500 $X then the Abarth version is barely less that $2X and the Tributo Ferrari is just less than $3X. The problem is that both versions are worth every single penny of the overprice. Driving the Abarth version is amazing and driving the Ferrari Edition is just unbelievable.